Some of the links below are PDF files, some are Zip files containing JPG files. For viewing JPGs, I recommend Irfanview, which is available for free at www.irfanview.com. For a good Zip program, I use Iceows, but any Zip program should do. For the PDFs, of course, you'll need the free Adobe Acrobat Reader. Note: If you have either the Gibson G201 or the Lowrey T2, get both manuals. 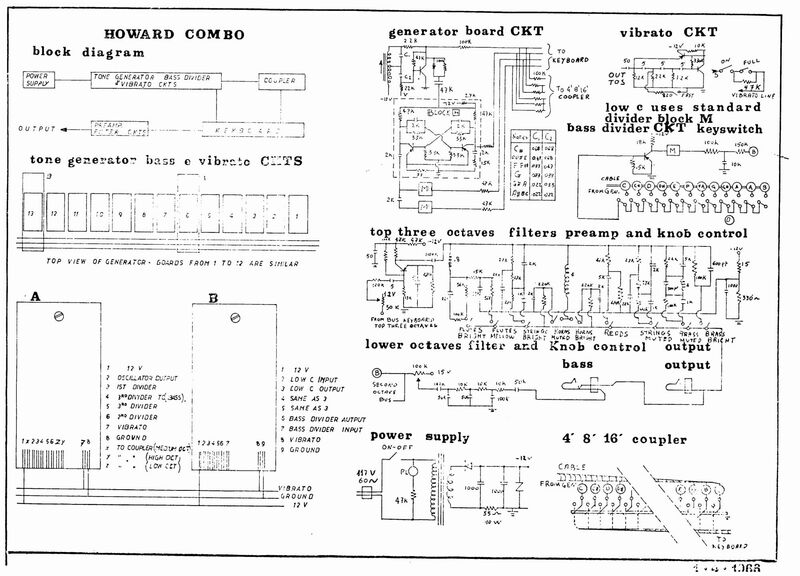 While the circuitry is nearly identical, and all the schematics are contained in each, there are several good diagrams that are unique to each manual. Plus, the schematic styles are different, and you may find one easier to follow than the other. Teisco schematics: These are kind of hard to come by, because as far as I know they only ever appeared glued to the inside lid of the organs.